A brisket is one more thing I have always wanted to make and I finally did it. I really wanted to do it on the grill but I was making at my brothers house and his grill ran out of propane…ugh. But no worries, I did it in the oven and it was delicious; just the way it should be; tender, lots of flavor and moist. I looked up several ways to make it, from the rub recipes to how to cook it and this is what I came up with. I used a 3.5 lb brisket. Wash the brisket and dry with paper towels. Rub the dry ingredients on both sides of the meat. 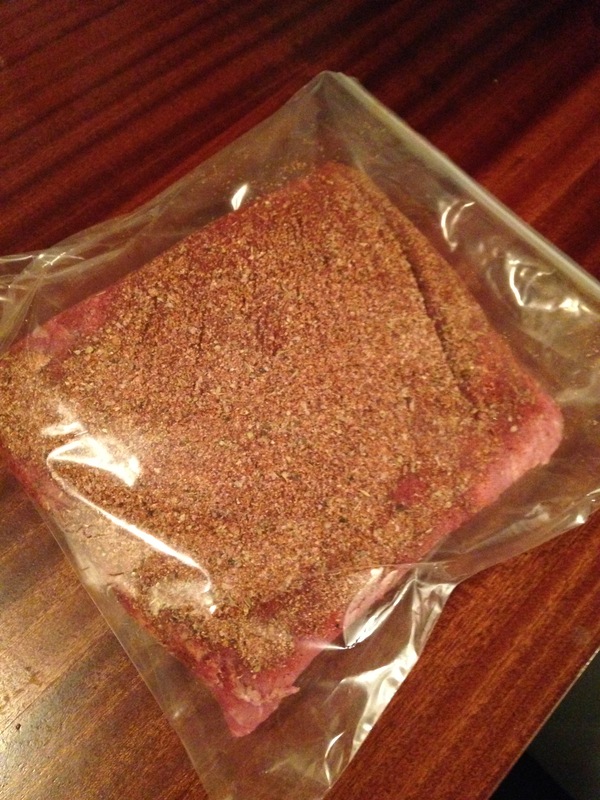 Put the brisket a plastic bag (squeezing out excess air as you seal it). I put mine in the fridge over night, you can do it for less time but I recommend at least 6 hours to let the meat soak in the flavors. For cooking time plan for about 1 hour and 15 minutes for every pound at 250 degrees. Low and slow. 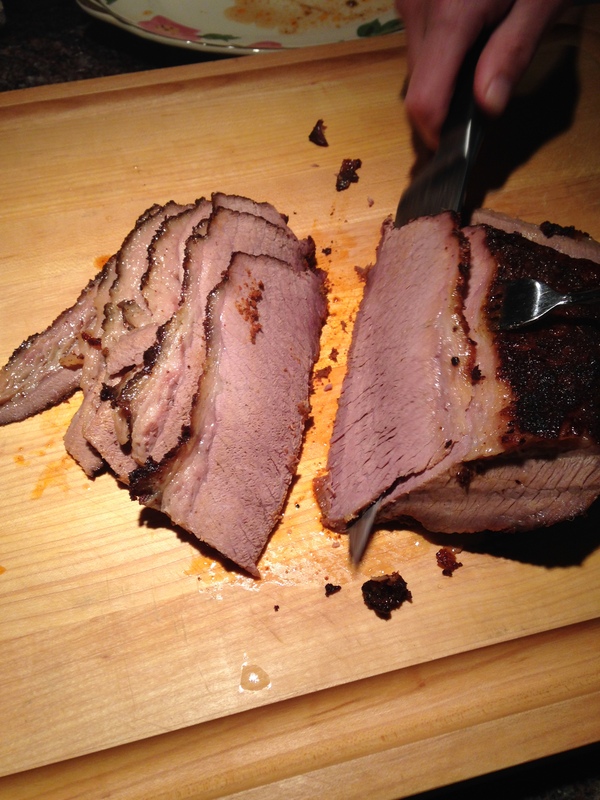 Take the brisket out of the fridge about 45 minutes before you want to cook it to bring it to room temperature. Pre-heat the oven to 250 degrees, place the brisket fat side up in a shallow baking dish. I planned on cooking mine for 4 hours. Place in the oven and let it do it’s thing. Now, I watched several BBQ shows on the Food Network and almost all of the award winning BBQ pit masters would wrap the meat in foil the last hour or so of cooking. So, I did that too and I really think that is what kept it from drying out. After 3 hours I wrapped it in foil and put it back in the oven, let it cook for another hour. When I took the meat out to wrap it in the foil there was a lot of wonderful juice in the pan, I saved this and put it on side to pour over the meat when it was served. And in true Southern style I served it with macaroni & cheese and coleslaw. It was absolutely delicious and we had brisket sandwiches with the leftovers! 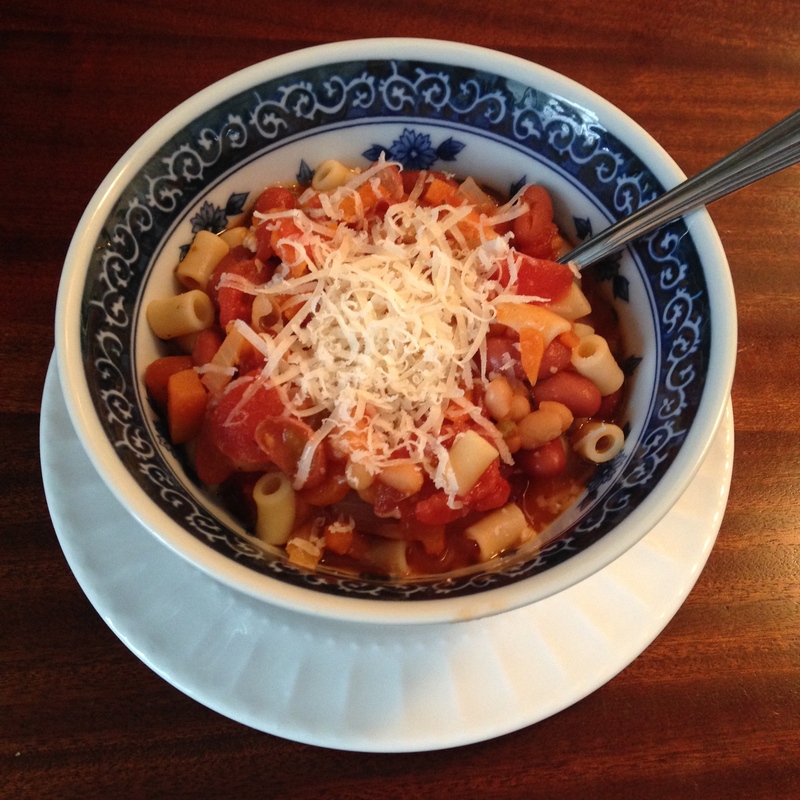 Here in the Northeast we are in a deep freeze and waiting on another snow storm, so what can I make that is hearty and warming? 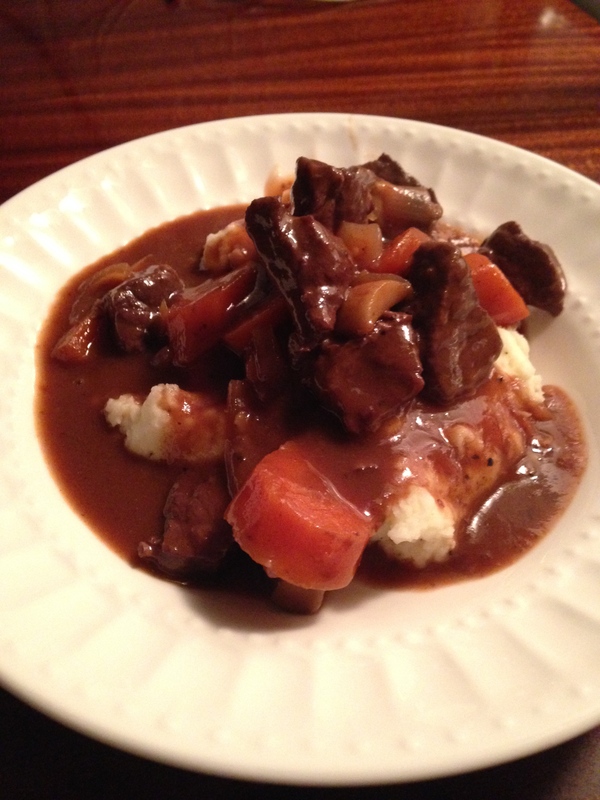 Beef stew but not just any beef stew, a French stew that is quite easy and very delicious. My husband actually said it was amazing! 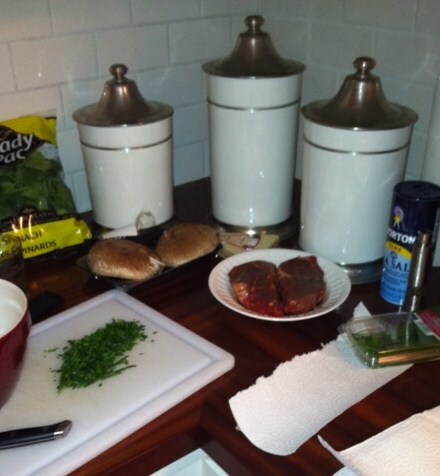 Using paper towels, dry the beef cubes thoroughly and sprinkle with evenly with salt and pepper. Heat 2 TB olive oil in a large Dutch oven over medium heat and sear the beef cubes in a single layer, working in batches until they are browned on all sides. Do not crowd the cubes, give them room to cook properly. Set seared cubes aside. Add carrots, onions, garlic, 1 TB kosher salt, 2 tsp black pepper to the Dutch oven and sauté for about 5 minutes until onions are browned. You may need to add more oil. 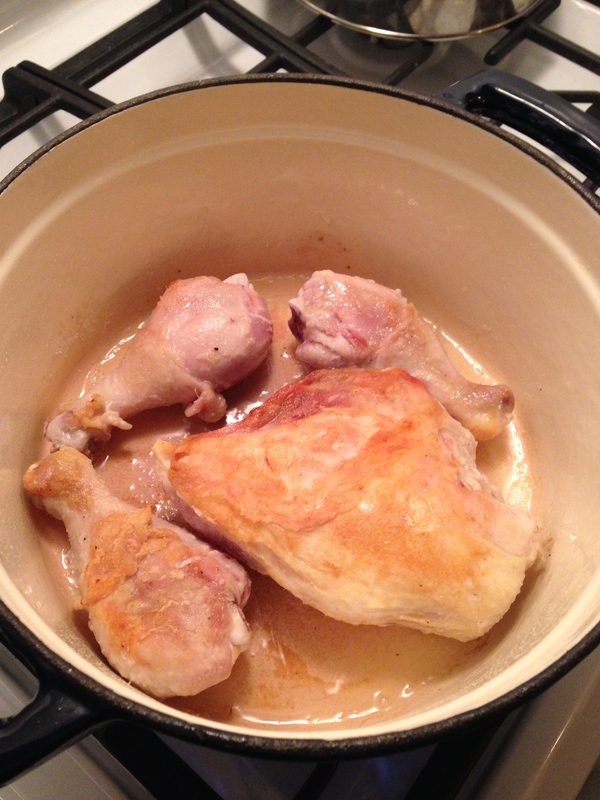 Once the onions are nicely browned, add the cognac to deglaze the pan and cook another 10 minutes on medium. Add beef back to the Dutch oven with the juices. Add wine and enough beef broth to almost cover the meat. Add tomato paste, thyme and bay leaves. Bring to a simmer, stir occasionally. Once liquid starts to simmer slightly, cover with lid and cook on low for about 1.5 to 2 hours or until meat is tender when pierced with a fork. Now, mix the 2 TB butter with the 3 TB of flour in a small bowl, set aside. Saute mushrooms with butter just until mushrooms become soft. Add the mushrooms, pearl onions, and the flour/butter mixture to the stew. 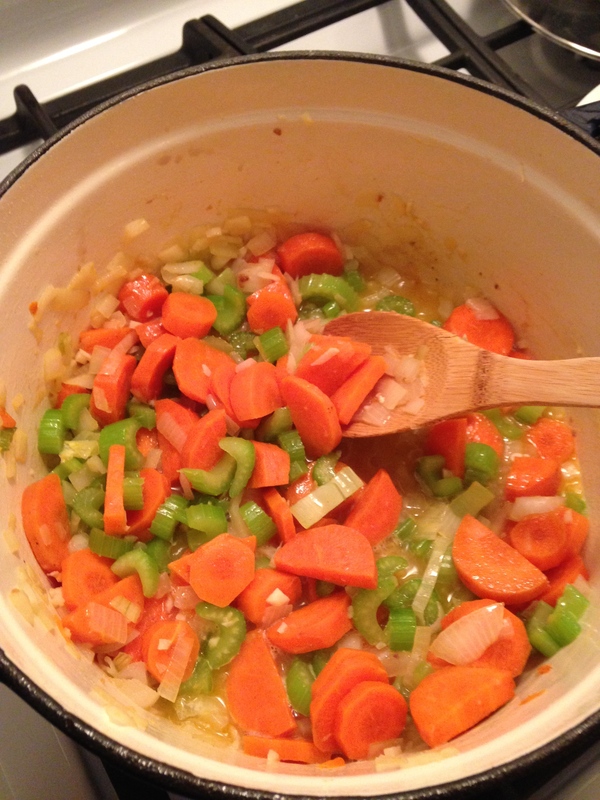 Bring the stew to a boil then reduce to a simmer. Cover and cook for another 30 minutes. Remove bay leaves, add salt and pepper if needed. 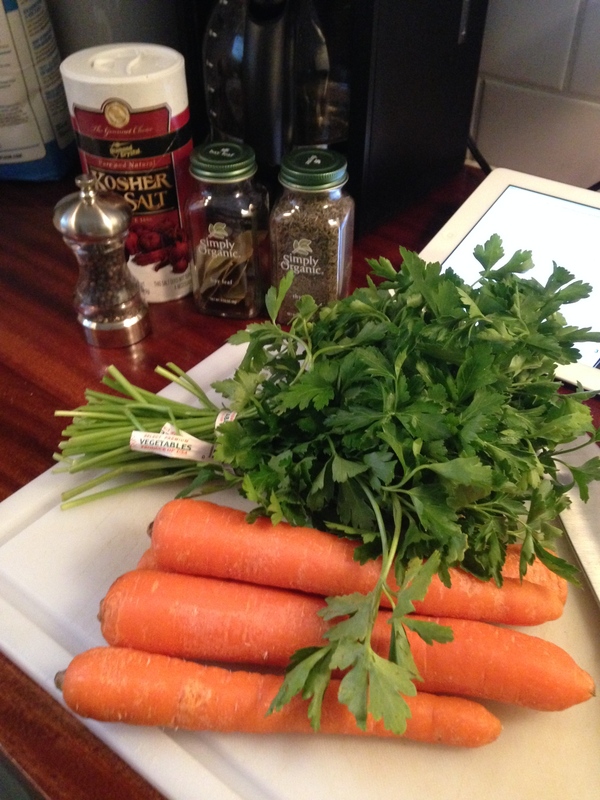 Garnish with fresh parsley, serve with crusty French bread, egg noodles or mashed potatoes and of course a nice red wine! The finished product with mashed potatoes! Bon Appetit! 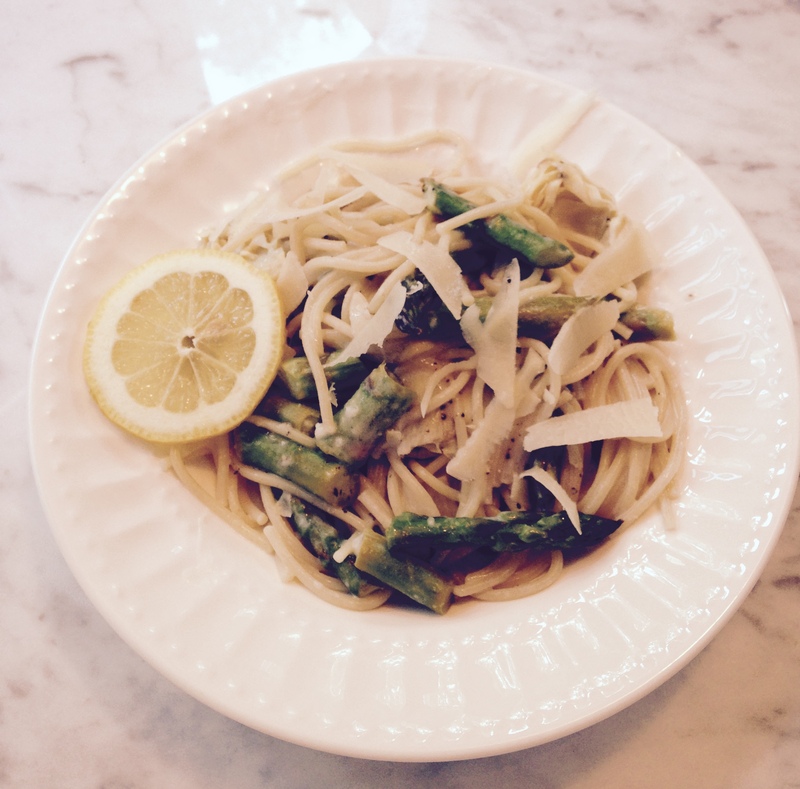 If you are like me, you are always looking for something new for dinner that is relatively easy and good for you, well this is it! My friend and co-worker Lisa shared this with me and both my Mom and my husband loved it. Now the original recipe didn’t have garlic in it but we added it and it definitely added great flavor. In a 12″ skillet over high heat, in 2 tablespoons olive oil, cook onion, garlic and celery until tender and lightly browned, stirring frequently, about 5 minutes. Add chili powder, cook 1 minute. Add tomatoes with the liquid, 1 teaspoon of salt, 1 teaspoon oregano and 1/4 teaspoon crushed red pepper flakes; heat to boiling, stirring and breaking up the tomatoes. 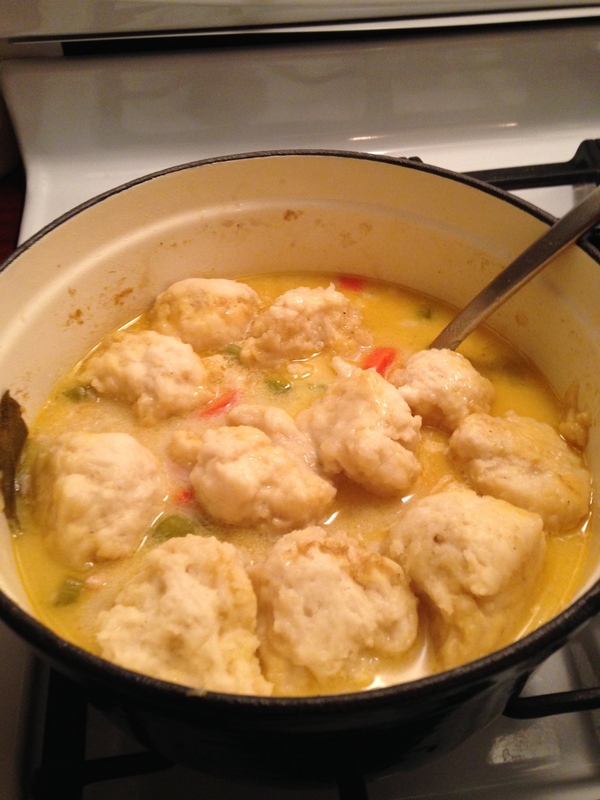 Reduce heat to low and simmer 10 minutes, uncovered, stirring occasionally. Stir in black beans, chopped parsley and vinegar; heat through. Meanwhile, in 10″ skillet over high heat, in 2 tablespoons hot olive oil, stir-fry shrimp with 1/2 teaspoon salt, 1/4 teaspoon oregano and 1/4 crushed red pepper flakes until shrimp turn pink and are tender. Now, I served this over a bed of rice, I like a starch to make the meal complete and I also tried this with some leftover chicken and it was delicious too. 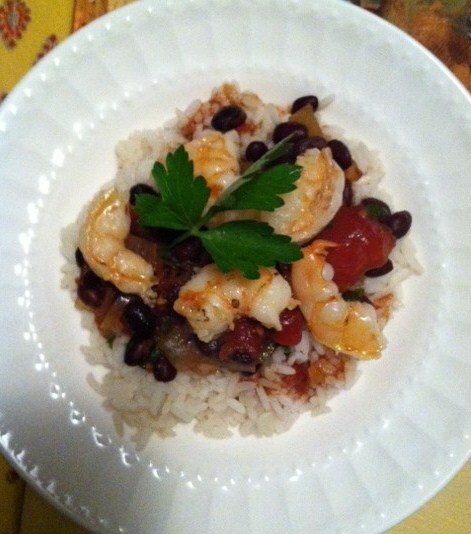 To serve, spoon tomato black bean sauce over a bed of rice and top with shrimp. Makes enough for about 6 people. Enjoy!